This Green Chili-Baked Chicken is a surefire hit. Chili sauce, canned green chilies, onions and cheddar cheese team up to take this weeknight chicken baked to a whole new level. Heat oil in large ovenproof skillet on medium heat. Add chicken; cook 2 to 3 min. on each side or until evenly browned on both sides. Combine ketchup, chili sauce, green chilies and onions; pour over chicken. Place in oven. Bake 20 min. or until chicken is done (165°F). Top with cheese; bake 5 min. or until melted. Sprinkle with cilantro. If you prefer a milder dish, substitute 1/4 cup chopped green peppers for the canned green chilies. 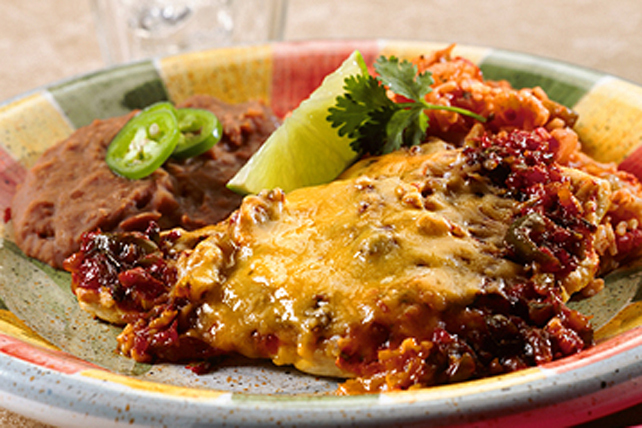 Serve with refried beans and cooked rice.